Gesadur Machine Underrollers are ideal for supporting large rotating machines. The Gesadur material is practically incompressible and even if left standing under pressure will return to perfectly round form after a couple of rotations. Gesadur is often supplied as pre-machined blanks with a universal oversize for final finishing at your own site. 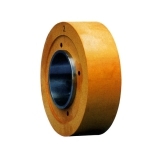 However, complete underrollers with fitted steel hub can be manufactured if required. Why supporting rollers are made of Gesadur WN®? 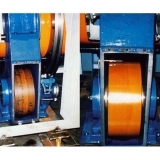 A number of machines are equipped with underrollers made of laminated fabric. These are fabrics of sheets impregnated with resin and compressed into plates. The rollers are turned out of these plates with their laminates positioned vertically to the running direction. This type of roller tends to wear quickly, as the material eventually delaminates. Due to the laminated structure of the material an adequate surface finish can not be attained. During long non operating times of the machine these rollers develop flats on the surface and these remain flat when the machine is restarted. The result is high noise and machine vibrations. Gesadur WN® is a homogenous material with a good surface quality. By changing to Gesadur WN® the rotational speed of the machine can often be increased, while the running noise is decreased. Due to the memory properties of the material the rollers are not subject to developing flats and vibrations are dampened. Trunnion or supporting rollers for cable and wire stranding machines, pressure rollers for spinning machines, insulating flanges for annealers, forming surfaces for metal spinning machines. - High impact strength leading to a longer service life. 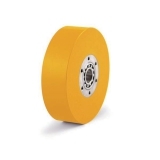 - Dampening of vibrations/oscillations conserves machine bearings. - Increase speed, increases output. - Smooth running surfaces without deposits means rotation without vibration/oscillation. - Resistant to oil and grease with good electrical insulation characteristics with low water absorption. - Memory: After an extended period of machine stoppage the flattening of the underroller is removed after a few rotations. - Pre-machined with universal oversize, this means 'extra material' of 2mm remaining on outer-Ø, inner-Ø and width. Final machining can be carried out yourself. As workshops are dusty, dirt may collect on the surface of the underrollers. This can lead to the underrollers being overloaded on small pressure points of the surface (where the dirt is) and this can cause the surface to burn. To clean the underrollers we recommend our special cleaning system and our cleaning fluid Gesaclean.